What if I lose my e>check-in sticker(s)? What is your health policy? What if my kid has special needs? How can I get my other questions answered? Where can I find information about baptism? What if I don't live close to a Crossroads location? What should my kids do while I’m serving? What if I wake up sick on the day I’m signed up to serve? How will I know what to do if there is an emergency? Can I serve in my kid's room? Do you have other material we can download for free? Do I need to contact you and ask permission to use the material? Is it possible to purchase these videos on a disc from you? The e>check-in system works like this: when you sign your kid in, you'll receive two stickers with matching numbers. One sticker goes on your child; one stays with you. To pick your child up, just show the sticker with matching number. This number will also flash on small screens in the auditorium if we need to reach you during the service. No worries! Just return to the e>check-in desk, show I.D., and get a new sticker. No fever, rash, diarrhea, or vomiting within the last 24 hours. No bad coughs or runny noses either. And if you’ve got any contagious infections, like pink eye, stay home. This goes for kids and volunteers. We’re committed to providing a fun, secure environment for every kid. Each site has a special needs room and volunteers for kids who need a little extra support. To find out more about it, visit our Special Needs page here. Call 513.731.7400 and ask to speak to Kids’ Club staff. All baptism/dedication information can be found on our Parent page here. Your family can still be a part of Crossroads through Crossroads Anywhere. Here are some ideas for ways to create an experience just for kids: CrossroadsKidsClub.net/anywhere. Children two and younger can stay in their Kids’ Club room; potty-trained three-year-olds and older can go to Adventure Club (AC), a special program for volunteers’ kids. Check your site for AC and childcare times. Life happens, and we understand. But since we are counting on you, please let us know. 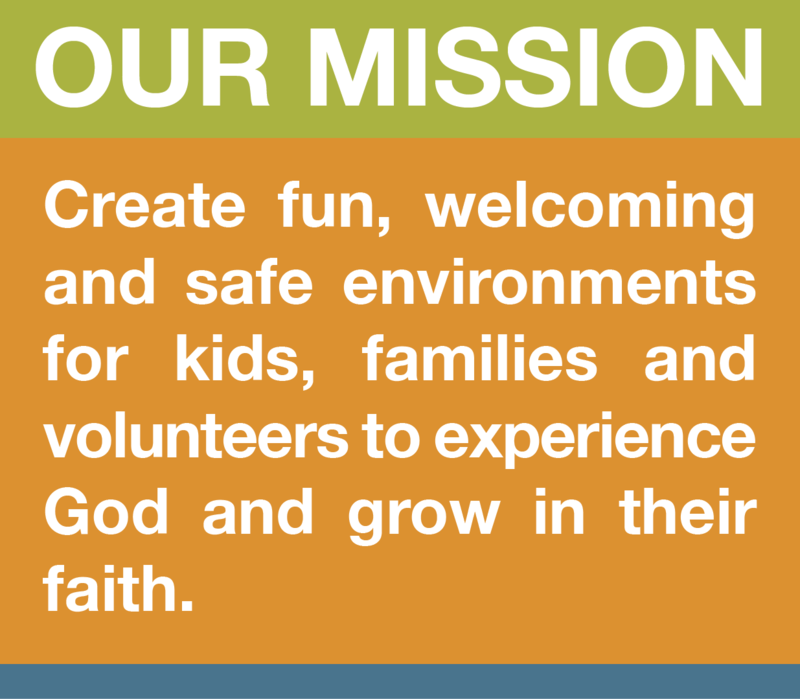 Give the Kids’ Club Info Desk a call at 513.731.7400 xKIDS and follow the prompts for your site. Look for the Emergency Packet in your room. There are instructions for all kinds of emergencies, including evacuation procedures. Can I serve with my kids? It’s okay to serve with your kids. Just be mindful that all your attention isn’t focused on your child. Also, we won’t put your kid in your small group. We just want the other kids—and yours—to feel comfortable. Get most (not all are available) of our videos (totally free) by going to our Vimeo page. If you are interested in using the materials on site at your church, feel free to use! Please do not make any alterations of any kind to videos (cutting out sections, replacing narration or any other changes). For any social media sharing, please share from our YouTube channel. Please let us know how things go (like what did or didn't work well, what kids and families said, pictures of the experience in process and other stuff) so we can continually improve the content developed. If you are a network, distribution channel or any other type of organization please contact us first so we can discuss an arrangement in further detail. Is it possible to purchase these videos on a disc? All of our available resources can downloaded through our website (documents, music, etc.) and Vimeo (videos). We don't sell our stuff - it's all free - and do not have resources to mail.